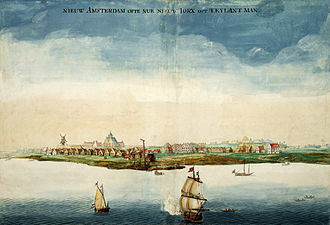 New Dorp – an anglicization of Nieuw Dorp, Dutch for New Village – is a neighborhood in Staten Island, one of the five boroughs of New York City, United States. 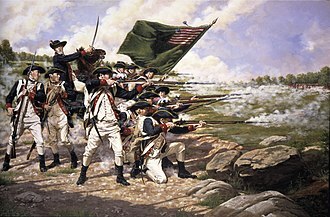 The community lies near the foot of Todt Hill, with Grant City immediately to its north, Oakwood bordering to the south, formerly one of the most important towns on the island before suburbanization, it was the center of much activity during the American Revolution. 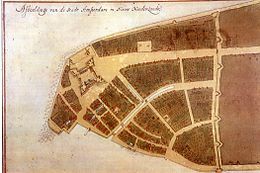 Like all of Staten Island, the area of New Dorp was populated by American Indians going back over 10,000 years. 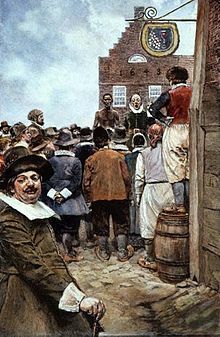 At the time of the arrival of the Europeans in the 17th Century, it was inhabited primary by the Raritans, the first recorded European settlement of the area was in 1671. The English, after having taken over the New Netherland colony from the Dutch, in the late 19th century, it became the home to members of the prominent Vanderbilt family, many of whom are buried here in the Moravian Cemetery. 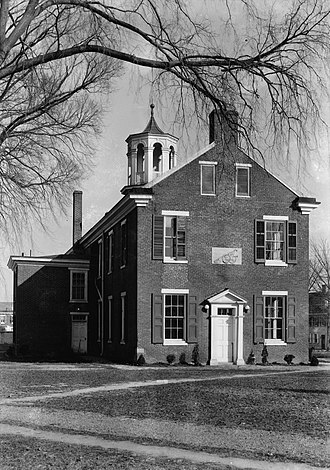 The Vanderbilt farm was used by the U. S. Army, as Miller Air Field. 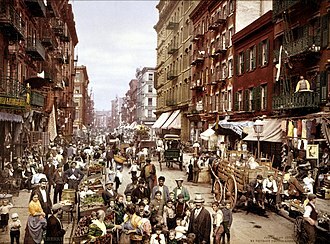 Today, the population is a majority Italian-American, Irish-American, Albanian-American, Polish-American and Russian-American ancestry. New Dorp is zoned to Public School 41, New Dorp and Intermediate School 2, other schools in the area include Saint Charles, P. S.38, and Paul Mitchells Hair Styling School. Several high schools are located in the area, including Staten Island Technical High School, New Dorp High School, private elementary schools include Our Lady Queen of Peace Parish Elementary School and New Dorp Christian Academy. One of New Dorps biggest shopping plazas is Hylan Plaza, home to a few big stores, Dugan Park is a large park in New Dorp. 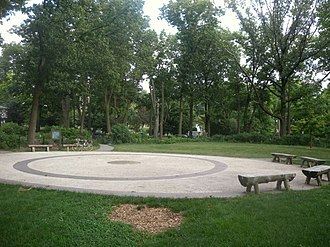 The park was named after Gerard P. Dugan in 1974 when it was renovated, the park is often referred to as Tysens Park since it is right off of Tysens Lane and because it is right across the street from the Tysens Apartments, a large housing complex. The park is usually crowded with people from schools as well as people from the apartments nearby. The park contains a field with 2 baseball/soft fields where leagues come play almost every weekend during the summer. There are 2 basketball courts, handball courts and jungle gyms for younger kids, New Dorp is the home of Engine Company 165 and Ladder Company 85 of the Fire Department of New York. Rondout, is situated on the Hudson, at the mouth of Rondout Creek. Originally a maritime village serving the city of Kingston, New York. It now includes the Rondout-West Strand Historic District, the creek empties into the Hudson through a large, protected tidal area. The name derives from the fort, or redoubt, that was erected near the mouth of the creek, the Dutch equivalent of the English word redoubt, is reduyt. As late as the 1820s, Rondout was a small hamlet, after the opening of the canal in 1828, the area of Rondout rapidly transformed from farmland into a thriving maritime village. The last several miles of the canal, which linked coal mines in northeastern Pennsylvania to the Hudson River and markets beyond, Irish laborers came to dig the canal and many of them stayed to work on it after its completion. 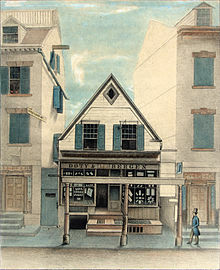 Businessmen established stores to serve the workers, sloops and barges loaded with passengers and cargo regularly left the port bound for New York City. New industries developed such as brick and cement manufacturing, bluestone shipping, as canal traffic increased and commercial businesses were built along the slope upward from the Rondout Creek. Rondout Creek was the home of the Cornell Steamboat Company tugboat fleet, the company was started in 1847. At one time it had a fleet of as many as sixty-two tugboats towing barges of coal and many materials on the Hudson River to New York. Eventually Cornell had a monopoly of towing on the Hudson River and employed hundreds of workers on their boats. By 1872 more than thirty steamboats were based our of Rondout, many of which, as well as a large number of barges and sailing vessels, were engaged in the transportation of stone, cement and ice. Steamboats such as the sidewheel Queen of the River, Kingstons Mary Powell, the little sidewheeler Norwich, was built in New York in 1836 by Lawrence & Sneeden of New York for the New York and Norwich Steamboat Co. Converted to towboat service, in which she from 1850 to 1923 and she was unexcelled as an ice-breaker, opening up the channels in the spring. The Erie Railroad paid her to clear a passage through the ice for its barge and Collyer, in Sloops on the Hudson, write that Capt. 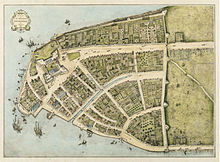 An 1807 version of the Commissioner's Grid plan for Manhattan; it was adopted in 1811. The Great Fire of 1835, as seen from Williamsburgh. New York City and the East River, 1848. 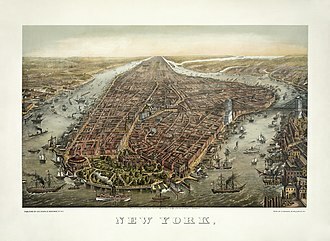 Bird's eye panoramic view print of Manhattan in 1873, looking north. The Hudson River is on the west to the left. The Brooklyn Bridge (to the right) across the East River was under construction from 1870 until 1883. 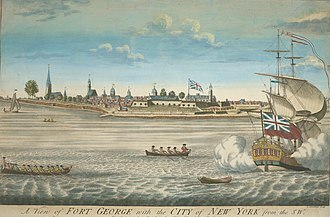 A drawing of New York City, created in the 1770s. 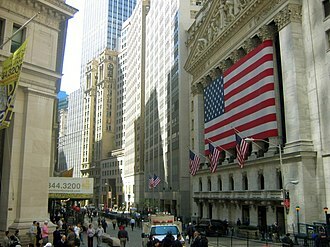 Trinity Church on Wall Street is visible in the distance.